Are you looking to grow your audience, help your readers, and get to know your new subscribers? A strengths quiz created with Interact Quiz-Maker is just what you need. No matter what your niche, you can create the perfect quiz that will do all these things! I’m showing you step-by-step how to create a quiz that your readers are sure to love. When people say strengths, they can mean different things. They could mean characteristics of a personality that a person naturally has. Maybe they’re especially friendly or determined. They might be talking skills that someone has gained over time. It could refer to something like graphic design or a certain software. Or they might be talking about natural aptitudes that people possess. Some people are natural organizers, while others are natural salespeople. All of these are strengths, and each one is amazing! What Exactly Is a Strengths Quiz? Quizzes work perfectly to help people recognize their strengths and the results show them how those strengths can be used in a specific capacity. Why Should You Make a Strengths Quiz? Plus, in a strengths quiz, there are no wrong answers or grades. Every answer is a valid answer and correlates to the given results. You really can’t fail a strengths quiz! Since there are no wrong answers, the quiz looks at which result the chosen answers fit with the most to find the strength. Don’t you love it when everybody’s a winner? Can a Strengths Quiz Work For You? I bet you’re wondering if a strengths quiz can really attract people in your niche. I am a Virtual Assistant, and I have a quiz for small business owners to help them identify their business strength. I chose to make this quiz to get potential clients on my email list. Then I can develop a relationship, provide value to them, and perhaps someday work with them. Maybe you’re a mommy blogger, and you can create a What’s Your Mommy Superpower? quiz as a lead magnet. You could have an online store, so a Find Your Shopping Strength quiz is what you need. Or maybe you have a digital marketing agency, and a What’s Your Top Marketing Skill quiz would be best to grow your audience. 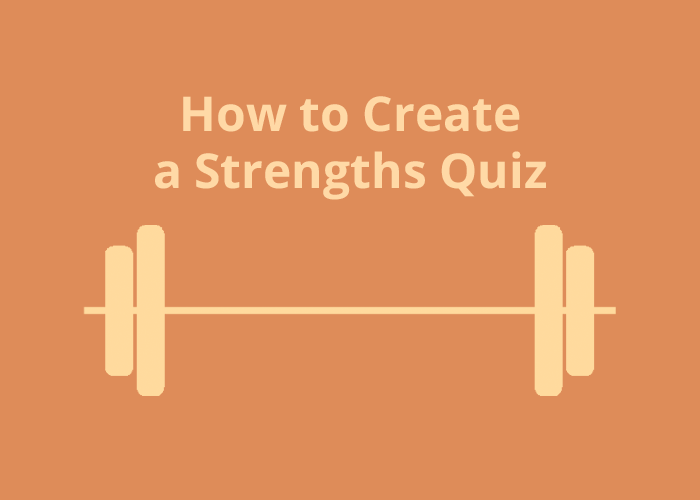 Now that you’re convinced that you need a strengths quiz for your website, let’s get building! Click here to build your own strengths quiz! How Do You Actually Build a Strengths Quiz? The nice thing about using the Interact Quiz-Maker is it’s so easy to build the quiz. Because it’s completely customizable, no two quizzes are the same. You can take the foundation given in the quiz-builder and make it your own! The first step in creating your quiz is to choose the quiz type. After you click on the orange Create New Quiz button, choose Template, and then select one or more of the industries that match what you do. Then you’ll choose Personality Quiz. If you want to learn more about creating other types of quizzes, check out How to Create an Interactive Quiz. After you’ve chosen your quiz type, it’s time to find a template that could work for the strengths quiz. There are so many options to choose from. For each quiz, it tells you how many questions are in the quiz, and you can preview the quiz to see what the questions are. It’s a good idea to check out a few quizzes to see which one connects with what you’re trying to do. Remember you can completely customize the quiz, even if you use a template! While pretty much any template can work for a strengths quiz, this is a good template to use for your first strengths quiz. Once you’ve chosen your template, you’ll be taken to the quiz builder. Working down the list at the left will make sure you customize everything you need to do to make the quiz your own. I like to work through the content first and then go back to finish styling the quiz. The first step to creating your quiz is changing the quiz cover. You can add a new title, a new image, description, and button text. To do this, you click on each item on the page and customize it. It’s super-simple, and you can change the wording to fit with your voice! Since I talked about creating a Pinterest quiz in the post I wrote about Interact on my website, I’m going a different direction for my example quiz here. Let’s say I wanted to create the mommy superpower quiz I mentioned above. Here’s how my quiz cover could look. Add an image that matches with your quiz topic and move on to the next step. Creating the strengths is the most important part of the quiz. This is where you provide value to your quiz-takers. It’s where you share the info they’re taking the quiz to get, and it’s where you want them to take action. On the menu at the left, you’ll notice all of the results for the quiz template. As you click on each, you’ll be taken to that result. For each result, you change the title at the top, the image (if you want to), the description, and the Call to Action (CTA) text on the button. For the description, you want to make sure you give the quiz-taker a summary of their results and the reason or reasons they should click on your CTA. Don’t make it so long that someone won’t want to read through the whole description! Here’s an example of one of the results page for one of my mommy superpowers. Notice I have the strength at the top, a picture that fits, a brief description, and a CTA. If I had a mom blog (which I don’t), this CTA could link to a blog category with organization tips or a resource library full of organizational printables. If you need help creating your result descriptions, check out this post from the Interact blog on How to Write Quiz Results. Don’t forget to change the URL on the CTA button. You can add a different CTA for each result on the quiz. I’ve linked quiz results to the Services page on my website, specific blog posts, blog categories, landing pages, and even business social media profiles. 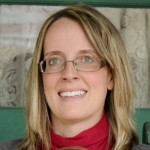 In How to Grow Your Facebook Quiz with a Quiz, Juliette Stapleton does a great job of explaining how and why she uses the CTA to direct quiz-takers to her Facebook group and how well it works for her. For my pretend mommy superpower quiz, I chose creativity and flexibility for the other two superpowers. I could choose a CTA that links to a blog category like creative activities for kids for the creativity one and a CTA that links to my pretend Youtube channel where I share funny mom life moments. Your CTA is anything you want it to be! Remember: You can have as many results as you want. If the quiz template has more results than you want, click on the gear next to the answer choice on the menu at the left and then Remove Result. If you need more results, choose Add Another Result at the bottom of the list at the left. Creating your questions and answers is an easy process with Interact Quiz Maker. Remember the purpose of the questions is to help guide the quiz-taker to their strength within your quiz topic. You can choose to only include questions that obviously tie in with your topic or you can throw in a few questions that are just for fun. I like to include a question or two that are for fun to keep people engaged. I love that you can easily switch the format of the questions. You can use question images, answer images, or any combination you want. In just a few clicks, you can completely change up your questions. You can see how the questions shown above fit with mom life and the answers tie in with my mommy superpowers of organization, creativity, and flexibility. You can include questions with answers that fit with one results, two results, or all results. It’s all up to you! If you are stumped thinking of questions, check out this List of Quiz Questions You Can Use to find questions you can add to your quiz. The list can also help you come up with new questions of your own. As you create each question, be sure to edit results correlations. This is where you set which answer choice fits with each result. Through clicking on each answer choice in the first column, you can connect it to the correct answer choice (or choices) by choosing them. Customize the result correlations whatever works best for your quiz. Notice how some of the answers in the picture above fit with one result while some fit with multiple results. It’s your quiz, so you can make your answers as specific as you want. Once you’ve completed your quiz and styled it to match your brand, be sure to head up to the top of the menu at the left and set up the lead capture capability. You can decide what information you want to include, allow people to see the results without subscribing (which actually makes them more likely to subscribe), and make your form GDPR compliant. The Interact quiz builder most likely integrates with your email service provider and walks you through the entire integration process to make sure it’s done correctly. You can also add people to specific lists, groups, or segments of your email list. People love to get emails that are more specific to their interests. I added my results to specific groups within my email list. That way, I can send specific emails to specific groups. On the image below, you can see that the people with the Flexibility result are added to my Flexibility group. By doing this, I can send emails highlighting my favorite organizational tools to my Organization group or real mom life moments to my Flexibility group. People are more likely to click through when the links are to products or posts that appeal to their interests. Now you know how to make your own strengths quiz. Your audience will adore the quizzes you create to help them find their strengths! Click here to create your strengths quiz now! Joanna May is a virtual assistant who specializes in Pinterest management, blog management, and general administrative tasks. When she’s not hard at work for her clients or writing her blog, you can find her spending time with her husband and two sons, volunteering, or learning something new! Head over to mayvirtualassists.com to learn more or follow May Virtual Assists on social media.